Launched at Portsmouth Navy Yard on 17 December 1929, Narwhal (originally designated V-5 and given the number SC-1) was commissioned on 15 May 1930, under the command of Lieutenant Commander John H. Brown, Jr.. An American incarnation of the World War I German “cruiser submarine” concept, Narwhal, along with her sister, Nautilus, was a huge boat, 371-feet long (59 feet longer than a Gato), mounting a pair of 6-inch guns on single open mounts. Designed for commerce raiding, neither would ever be employed in that role—at least, not with guns. Renamed Narwhal in 1931, she was then given a traditional sequential hull number (SS-167). She served in the Pacific during the 1930s, and was present at Pearl Harbor at the time of the Japanese attack. Narwhal departed Pearl Harbor on her first war patrol on 2 February 1942, with Lieutenant Commander Charles W. Wilkins, USNR, in command. She spent two days on a reconnaisance of Wake Island before continuing to the Ityukyu Islands. 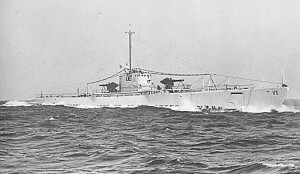 On 28 February she was credited with damaging the 6,515-ton Maju Maru, and six days later she was able to sink the 1,241-ton Taki Maru in the East China Sea. Narwhal returned to Pearl Harbor on 28 March. Narwhal‘s short (15 day) second patrol found her participating in the defense of Midway. Together with Plunger (SS-179) and Trigger (SS-237), Narwhal scouted east of Midway. The Battle of Midway was one of those rare times when the fleet submarines actually functioned in more or less the role they had been designed for, serving as scouting units for the main fleet. Most of the time they would operate independently or in small groups. Narwhal‘s third war patrol, and her last under Wilkins, found her hunting in the Kuriles. On 24 and 28 July she claimed a pair of inter-island freighters. 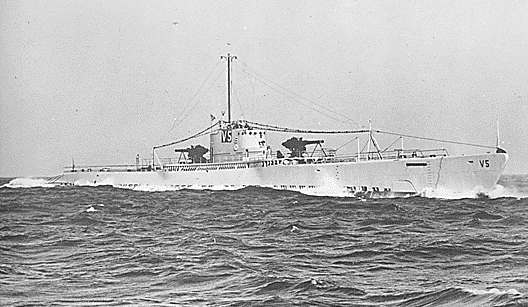 Then, on 1 August, she sank the 2,921-ton Meiwa Maru, afterward eluding enemy aircraft, which dropped bombs and depth charges. On 8 August, Narwhal put down the 2,559-ton Bifitku Maru. The patrol got a little exciting on the morning of 14 August, when Narwhal came to periscope depth to find three Japanese destroyers crossing her stern. Someone on one of the destroyers evidently noticed the periscope, and Narwhal was forced to endure a vigorous depth charging. Damage was slight, and the following day she started back to Pearl Harbor. Sailing for Mare Island Navy Yard on 8 September, Narwhal arrived on 15 September. After completing her overhaul, the big submarine sailed for San Diego, arriving on 6 April 1943. She took aboard the 7th Infantry Scout Company, who were scheduled to participate in the invasion of Attu, and set out for Alaska on the 18th. Narwhal‘s fourth war patrol began from Dutch Harbor on 30 April, with Commander Frank D. Latta now occuppying the captain’s stateroom. Together with her sister cruiser submarine Nautilus (SS-168), Narwhal was employed transporting and landing Army scouts. While she would sink a couple more ships during her career, it had by now been realized that these giant submarines were ill-suited for the job of hunting enemy shipping. For the most part, both Narwhal and Nautilus would be employed mainly in support roles for the rest of the war. After landing the troops, Narwhal made a stopover at Dutch Harbor on 14-18 May, then returned to Pearl Harbor. Her fifth war patrol once again took Narwhal to the Kuriles, departing Pearl Harbor on 26 June 1943. Her mission was to create a diversion by using her six-inch deck guns to bombard the Japanese airbase at Matsuwa, keeping the enemy too busy to notice Lapon (SS-260), Permit (SS-178) and Plunger slipping out of the Sea of Japan through Etorofu Strait. Beginning her bombardment on 11 July, Narwhal drew enough attention on the night of the 15th that she was forced to discontinue her shelling when the enemy started shooting back. Her mission was deemed a success, as the other three boats were able to slip out without being detected. Departing Pearl Harbor on her sixth war patrol on 31 August, Narwhal would patrol to Brisbane, Australia by way of the Marshall and Solomon Islands. On the morning of 11 September she torpedoed that 4,211-ton Hokusho Maru. The target sank, but Japanese escorts found Narwhal and subjected her to a severe counter attack with depth charges. Surviving this, the boat then headed for the area of Kwajalein and thence, late in the month, for Australia. Upon her arrival in Australia, Narwhal was prepared for what would be her primary role for the rest of the war, running cargo and passengers to occuppied islands. As she departed for her seventh war patrol on 23 October 1943, Narwhal was carrying 92 tons of ammunition and stores, along with ten passengers. On passage to the Philippines, she had to elude a pair of Japanese ships, who opened fire on the night of 10 November, while she was in the Sulu Sea. On the night of the 13th she slipped in Paluan Bay and debarked her passengers and half her cargo. Leaving Paluan Bay she made her way to Nasipit, Mindanao, where she docked on the 15th and unloaded the rest of her cargo. Taking aboard 32 evacuees, including eight women, two children and a baby, Narwhal then set out on the return trip to Darwin. On 25 November Narwhal set out on her eighth war patrol, this time carrying 11 Army operatives bound for Cabadaran, Mindanao. She arrived at Buttian Bay on 2 December and put her passengers ashore. Picking up seven evacuees, she then sailed for Majacalar Bay, arriving off Negos Island on 3 December. Narwhal took on seven more passengers and departed on 5 December. Around sunrise she used her deck guns to sink the 834-ton Hinteno Maru. Arriving at Darwin on 11 December, she debarked her passengers and then continued to Fremantle. Narwhal‘s ninth war patrol found the big boat returning to Darwin to pick up Commander F. Kent Loomis, who would be aboard as an observer, and more stores. She transited Surigao Strait and made a submerged patrol off Naso Point, Panay, before heading for Pandan Bay, where some of her cargo was offloaded into sailboats. She took on six passengers off Negros Island on 7 February and left 45 tons of supplies. An addition 28 evacuees were also taken aboard for the trip back to Darwin. Starting her tenth war patrol on 16 February 1944, Narwhal again humped ammunition to Butuan Bay. She left there on 3 March, now carrying an additional 28 people, headed for Tawi Tawi. That evening she was able to damage the 560-ton river gunboat Karatsu (ex-U.S.S. Luzon, and was rewarded by a heavy depth charging. Sources are somewhat ambiguous as to whether Karatsu was merely damaged, as Narwhal‘s history indicates, or actually sunk, as the entry for Luzon says. Two nights later three Japanese destroyers came up on her while Narwhal was ferrying cargo ashore. She eluded them and headed back for Fremantle, transfering her passengers to the Royal Australian Navy tug Chinampa on 11 March. Commander Jack C. Titus took over for Narwhal’s eleventh war patrol, which commenced at Fremantle on 7 May 1944. She sailed for Alusan Bay, on Samar, and landed 22 men and supplies on the night of 24 May. Sixteen more men and additional stores were unloaded on the southwest coast of Mindanao on 1 June, after which Narwhal ended her patrol at Darwin on the 9th. During her twelfth war patrol, which began on 10 June, Narwhal closed the shore at Bula Ceram Island to shell gasoline storage tanks and set fire to a power house and pumping station before having to pull back to escape enemy counter fire. Just before sunset on the 20th she rendezvoused with native boats, who would take nine and a half hours to ferry her cargo ashore. A half hour after finishing unloading, Narwhal had to evade a Japanese sub chaser. She was successful in this, getting away with 14 evacuees. On the 21st, she attacked a Japanese sea truck and, two days later, a tanker. She landed her passengers at Port Darwin at the end of June, then continued on to Fremantle, where she ended her patrol on 7 July. Narwhal departed Fremantle on 12 August for the thirteenth war patrol. This was a supply run to Dibut Bay, on the east coast of Luzon. Commander Charles Parsons, liaison in the Philippines supply and evacuation missions, had directed the building of a number of bamboo rafts, which greatly speed the unloaded. On 2 September, the boat took off four evacuees and sent a party and supplies ashore off the mouth of the Masanga River. She ended her patrol at Darwin. Narwhal‘s fourteenth war patrol commenced on 14 September 1944, hauling men and supplies to Cebu on the 27th. On the 29th, she collected 31 liberated POWs at Sairi Bay. The prisoners had been aboard Japanese transports sunk by )Paddle (SS-263) off Sindagan Point on 6 September. On 30 September, Narwhal experienced what was potentially her closest call of the war. Diving to avoid an enemy anti-submarine aircraft, her stern planes became jammed at a 20-degree angle. Narwhal had to blow main ballast to keep from diving out of control, which resulted in her popping to the surface stern first two minutes after starting to dive. She managed to get back under, this time under control, before the plane could return and attack. On the conclusion of her fourteenth patrol, Narwhal moved her base of operations to Mios Woendi, in Dutch New Guinea. It was from there, with Commander William G. Holman now in command, that she commenced her fifteenth and final war patrol on 11 October 1944. On the 13th, a Friday, a PBY charged in to attack, recognizing Narwhal as an American sub only at the last minute. The plane then signaled “good luck” and flew off. She was off Tawi Tawi on the 17th, delivering 11 tons of food. Two days later she unloaded the rest of her cargo, along with 37 men, at Negros Island. She collected 26 passenger, who would be delivered at Brisbane. That was the end of Narwhal‘s active combat service. On 6 January 1945, she left Brisbane, sailing to the Philadelphia Navy Yard, via the Panama Canal. She arrived at the Navy Yard on 21 February, and was decommissioned on 23 April. Stricken on 19 May 1945, Narwhal was sold for scrap. Her two six-inch guns were saved, and are now on display at the Naval Submarine Base New London, in Groton, Connecticut. First Captain: LCDR John H. Brown, Jr.